This magnificently maintained Ketch, has been built with 4 layers of Mahogany, Tough, Trustworthy, Safe and Very Comfortable. 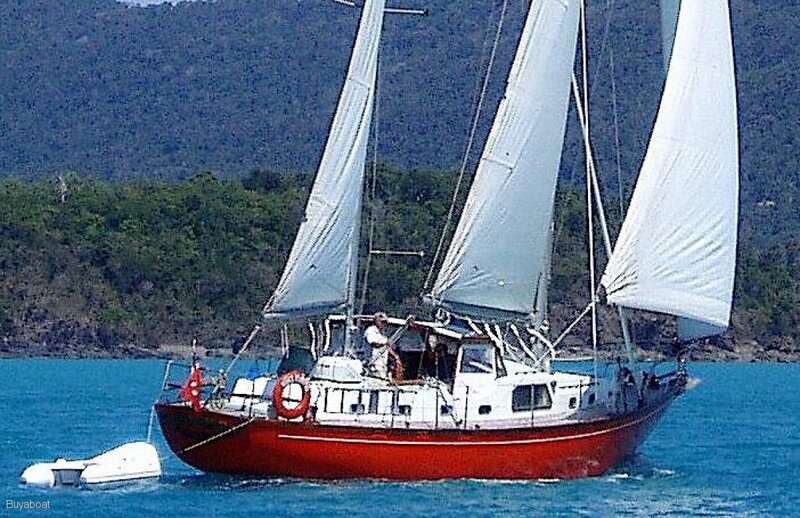 A great cruising Vessel, this boat has cruised the Pacific for the owner and his wife and has been looked after and loved. She is set ready to sail up the coast or live aboard. If you love beautiful, Timber then you will love ' Shikama '. 44 Hp Shaft drive, Fresh Water cooled. Large galley, with Gas Stove 2 burners and oven, stainless steel sink, heaps of cupboard space. Large top load 100 L eutectic fridge in tunnel. Large top load 100 L eutectic freezer in tunnel. V berth 2 bunks, Large captains cabin with master bed and single bed with heaps of room to change. Also quarter berth in tunnel. Also sleep one on saloon. Yes part of head on port side. TV 24 with DVD, FM radio, electric Keyboard. Muir electric anchor winch, 60 il plough anchor, 60 m chain, fenders and lines. 12 v plus LED Lighting, 2 x 40 W solar, 3 x 110 amp hr House battery, 1 x starter battery, 2430 V Invertor, battery charger. Ketch- Main 70 %, Foresail 70 %, Missan 70%. Spare main, Mizzen and Foresail, Storm sail, Inner Stay sail, Furling MPS. Rigging over 10 years, Moderate. Boat hook, boat swim ladder, fenders and lines.